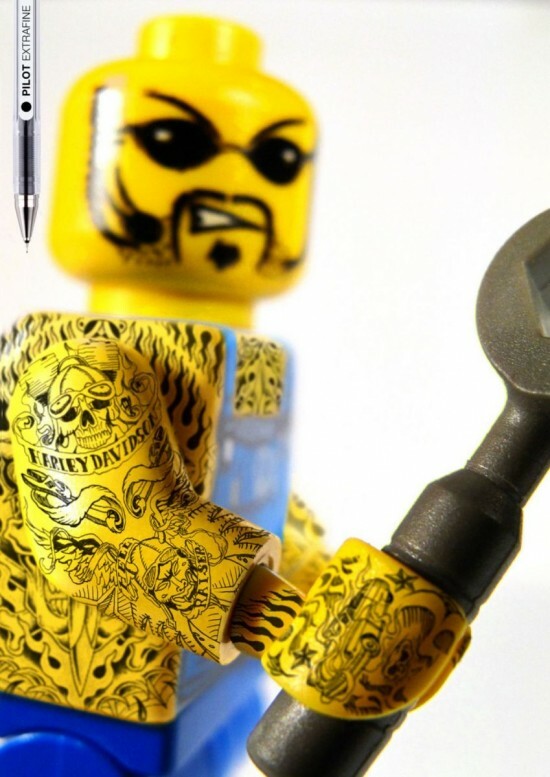 While this space is no stranger to LEGO tattoos*; these ads for the Pilot Extrafine take the concept of tats to a new level. The viral campaign (h/t to Flavorwire) features a series of minifigures with intricate ink drawings that suggest a level of toughness heretofore unacheived by the tiny plastic men and women. While I'm not sure about the back tattoo on a female minifig, it's hard not to appreciate the dragon tattoo the spans the arm of a smiling prisoner minifig. It makes me want to go out and etch a single teardrop on every minifig I own. *Sadly, Nathan Sawaya's thumb tattoo has faded to the point where it is quite faint. I saw it firsthand at Comic Con and the dastardly quick regrowing thumb skin has made it into an impression, rather than a bold statement. Nathan promises to get it touched up shortly and return it to its former brilliance. Hi - I just wanted to tell you that I finished reading your book and absolutely loved it. My fiance is really into LEGO and I am slowly being introduced into that world :). We are going to the Brickfair Lego Fan Festival in DC this coming weekend and its the first event like this either of us have attended - we're psyched! Anyway - love the book, enjoying your blog, you're such a talented writer! We are launching the figures at a special event in LEGOLAND Windsor on 14 August with a real ice meteor crash (!) so if you are interested in more information on this please let me know. We do have an embedded code for our viral which means that you don't need to divert people away from your site to view. Let me know if you'd like this sent. We are also providing product samples for review - again, let me know if you would like some sent. Hope you guys had a great time at Brickfair. Your fiance is lucky to have such a supportive fiance. Be sure to remind him of that fact often.